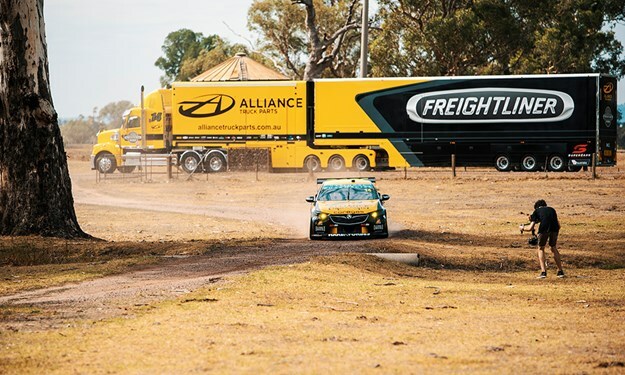 The Freightliner Racing/Alliance Truck Parts Supercar have upped the ante with the release of their 2019 season launch video. After pulling the covers off Tim decides to let loose in the open paddocks while the Freightliner Coronado, known as Stax, is left to begin its own journey to the start of the Supercar season. "We had fantastic feedback on our launch video last year and it definitely stood out from the rest," says team boss Brad Jones. "We knew we needed to deliver something like this again for Freightliner/Alliance Truck Parts and our fans and we think this one might just be bigger and better. "More of the Freightliner Coronado, more of the Supercar and a mountain of dirt! It’s very cool for our team to showcase our partners like this, the buzz it creates is pretty awesome. "When we unveiled a double Freightliner/Alliance Truck Parts livery in Darwin with team-mate Nick Percat, we featured more black on the front his car to make them stand apart. "People enjoyed the tough look of the Supercar, so we’ve got more of the shiny PPG black at the front with the big, bright pops of yellow. "Tim was quite close to standing on the podium a couple of times last year, and there’s no doubt we’d like to get him back up there again in 2019. We’ve learned a lot of lessons over the last year with the ZB Commodore and are looking to improve on the consistency and deliver some good results." The Freightliner/Alliance Truck Parts Commodore will make a much cleaner debut on track at the 2019 Virgin Australia Supercars Test Day at Phillip Island on February 14. The official test day to open the season will be open to the public from 9am to enjoy their first on track look at the Supercars class of 2019.